But for me - Modak are more than that - ukadiche modak stand for prime-time-failures! I am not sure if it's wise to write about this on my recipe blog.. but here it is anyway. I believe a typical desi (Indian) daughter-in-law (DIL) tries to impress her in-laws.. AT LEAST til she figures out that it's not possible! ;-) No - I don't buy the "I really don't care what the in-laws think about me." argument. I am no exception to the rule! I don't want to go into "why" or "whether it is the right or wrong thing to do", but I think - cooking "delicious" meals - continues to be the most promising way of establishing a good impression on most Indian in-laws. So when I successfully made Ukadiche Modak at the first shot.. 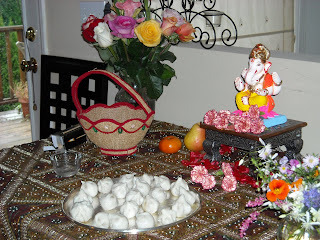 I felt great.. and of course I wanted to make Modak for my in-laws... I had made really good Ukadiche modak 2-3 times before my in-laws visited and was very confident that the will turn out just fine! Guess what - not once - but twice.. I have tried to make Ukadiche modak for Kaka Kaku (in-laws) and have failed!! and what's worse is that I make Ukadiche Modak every year for Ganesh Chaturthi and Anant Chaturdashi (visarjan day). Every year folks rave about the modak and all I can do is send pictures to my in-laws :-) - of course I will try again and I am sure one day my in-laws will eat delicious ukadiche modak made by their DIL..
needless to say it is a bit tricky to get these right.. 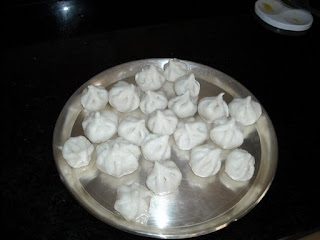 Source: Aai - My mom makes THE BEST ukadiche modak in this world!!!! Make the filling mixture before the ukad/steamed rice flour. Heat ghee in a pan just enough to coat the insides of the pan. Add coconut and jaggery to the pan and mix really well till jaggery is completely melted and mixed with the coconut. Depending on the color of the jaggery you will get a pale-dark yellow colored mixture. Add the saffron strands if you want extra color and flavor. then add cardamom powder and mix well. Cover the pan and heat for about a minute on low-medium heat till the coconut is cooked completely. Use a fine strainer to separate any coarse particles from the rice flour and keep it aside. Heat water along with salt and oil. Wait till you see water boiling. Exactly when the water is boiling, add the rice flour to it and lower the heat. Mix really well till you get a semi-soft blob of steamed rice flour. Keep this pan covered at all times till you are done making modaks..
Take small portions of the teamed rice flour - about a handful at a time and knead really really well.. either with the back side of a bowl or with bare hands coated with cold water. Once you get to a really soft consistency, take a small portion in the size of a lemon. Press with thumb to dig a well in the ball. Keep pressing gently till you get a thin wall for the well. Add 1.5 tsp of the filling mixture to it. Pinch the walls at 6-7 uniformly spaced points on the well and slowly close the sides to get the shape of a modak. Steam the modaks for 15-20 minutes like Idli or Dhokla. Enjoy with lots of desi ghee!